The descendants of John and Martha Winker will hold their annual picnic on Sunday, June 30, 2013, beginning at 12 noon, at the 4H building in Howard, South Dakota. Hosted by the family of Buck and Trudy (Winker) Schwader. The descendants of Lewis and Cecilia Winker will hold their annual picnic? E-mail list of Winker News. Reunions, births, weddings, graduations, new jobs, any news and photos that may be of interest to other Winker family members. Welcome to WINKER.NET, genealogy information for those with the surname "Winker". This location is meant to allow family members to share news, photos, and family history. Family Biographies and photos. In addition to Winker family biographies, there is ancestry information on the Lux, Goerger, Borgmann, Richter, Calhoun and Feuerstein families that are related to the Winker family. Most of these families had their origins in Germany/Prussia, and all immigrated to America in the early to mid 1800s. The Calhouns were from Ireland (obviously) and arrived around 1820. The Winker surname can be traced primarily to the town of Spaichingen, Baden-Württemberg, not far from Switzerland. Most Winker ancestors originated from this vicinity. I have not posted many updates in recent months as much of my research is at a standstill. I did get a phone call from LUX researcher Ann Gilchrist that she had located the ship's record with the Florian Lux family. In November, 2010, I had the opportunity to meet with Dawn Winker, granddaughter of Henry Joseph Winker, in Portland, OR. We had a nice visit and spent a few hours sharing family stories. Nov 2008 - Looked up the WHITE and BERTRAM familes on Ancestry.com. Catherine LUX was married to Norwood WHITE, Ruth LUX married Herbert BERTRAM. Much of the information was found in U.S. and Minnesota census records. WHITE - Traced back to James H. White, born 1844 in NY. He married Phoebe McCollum, born 1850 in NY, about 1868. Their youngest son was James H. White Jr., born 1879 in MN, married to May Busch about 1908. Norwood White was the 5th of 7 children born to James and May White. BERTRAM - Peter Bertram, born 1846 in Germany, arrived in the U.S. in 1872 and settled near Spring Hill, Minnesota. He married Caroline (last name unknown) in 1876 and they had nine children who survived to adulthood. Mathias and Edith (LNU) were married about 1913 and were the parents of Herbert Bertram. 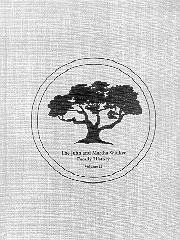 The Winker-Lux Family Tree can be found at WorldConnect at RootsWeb.com. The database contains over 5000 individuals, though the names of living persons have been removed. The database is viewable, but may not be downloaded. Latest update: 1 Apr 2009. A Family Group Sheet (FGS) form has been added to this site to make it easier to share your family's birth, marriage and death info for the Family Tree. CLICK HERE to view the FGS form.